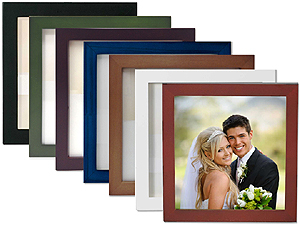 High quality solid wood picture frame is perfect for showing off a favorite wedding proof. Holds 5x5 photo. Includes glass, MDS wood backing and hooks. Availability: Ground orders usually ship in 2-3 business days except Blue (Expected 05/03/19), Green (Expected 05/03/19), Nutmeg (Expected 05/03/19), White (Expected 05/03/19). Add To Cart to view ship rates and delivery dates. This high quality solid wood picture frame is perfect for showing off your favorite wedding proof or square Instagram photo.